Russia, the world's largest country, is a land of superlatives matched by its epic history, monumental architecture, incredible culture and sweeping landscapes of immense beauty. Perhaps the best way to cover the breadth of its myriad gems and feel the might of empires past is on a relaxing river cruise, where every turn reveals a fascinating new view. 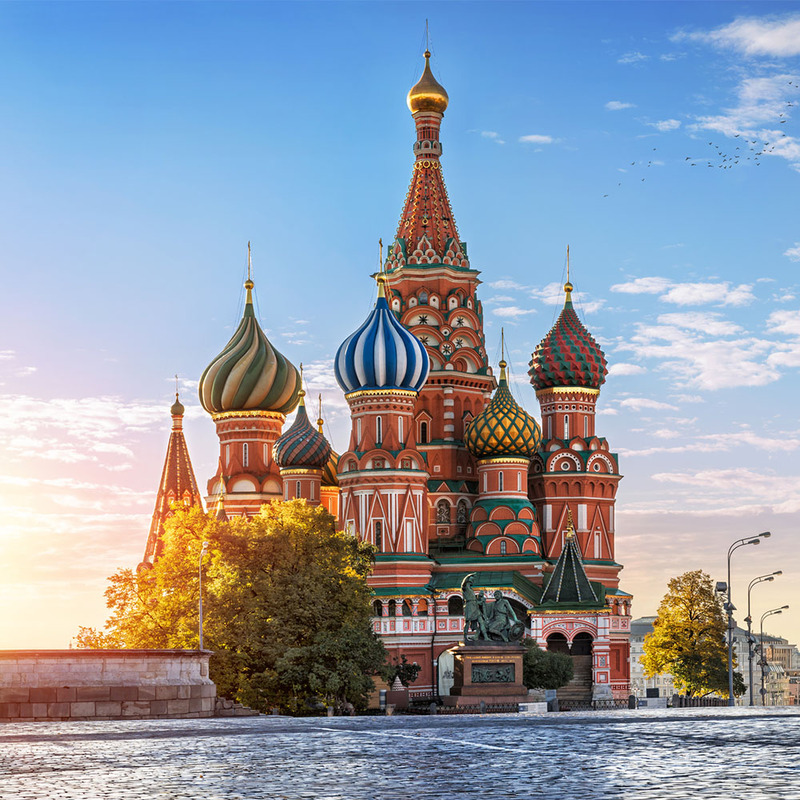 Our 11-night cruise begins in Moscow, the enigmatic capital and a dazzling metropolis, with a glittering array of Unesco-listed monuments: the magnificent 70- acre Kremlin fortress and historic Red Square, with the strikingly colourful onion-domed cathedral of St Basil taking centre stage. 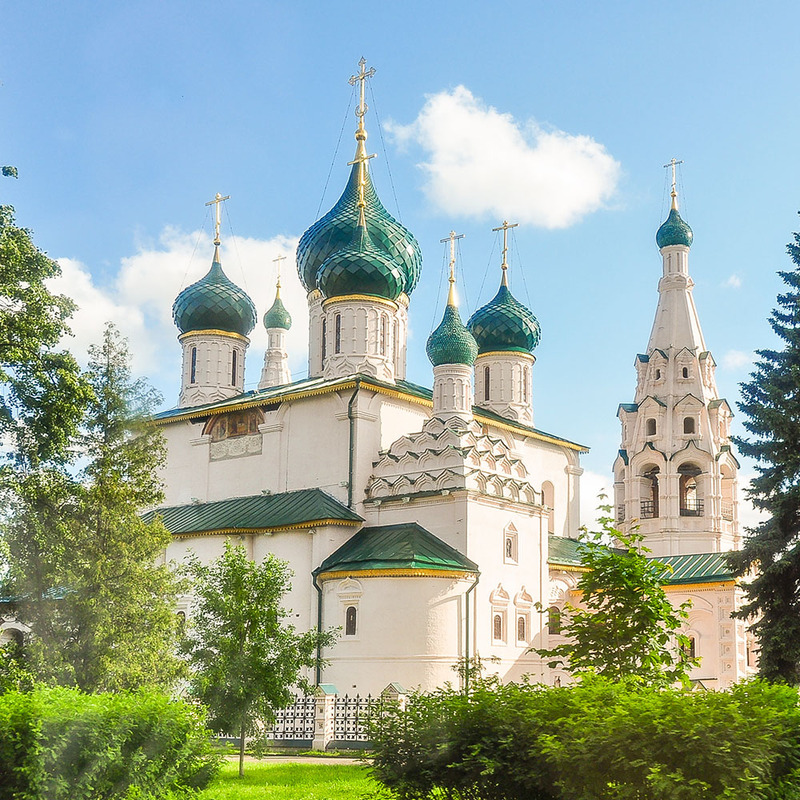 Beyond Moscow's glitz and glamour, we discover another side to this intriguing country. The mighty 'Mother Volga', Europe's longest river, entices us with a different landscape: swathes of ancient silver-birch forests, centuries-old churches and brightly painted timber houses in quintessential villages lost in time. We'll visit the medieval Kirillo-Belozersky Monastery and the historic cities of Yaroslavl and Uglich on Russia's famous Golden Ring. Cruise the waters of the stunning River Svir, which flows between the rocky fissured shores and tranquil bays of Lake Onega to the wild marshlands of Lake Ladoga, two of Europe's largest lakes. We call at the fairy-tale village of Mandrogi and also Kizhi Island to see the outstanding Church of the Transfiguration with its 22 shimmering domes - a wooden masterpiece built without a single nail! 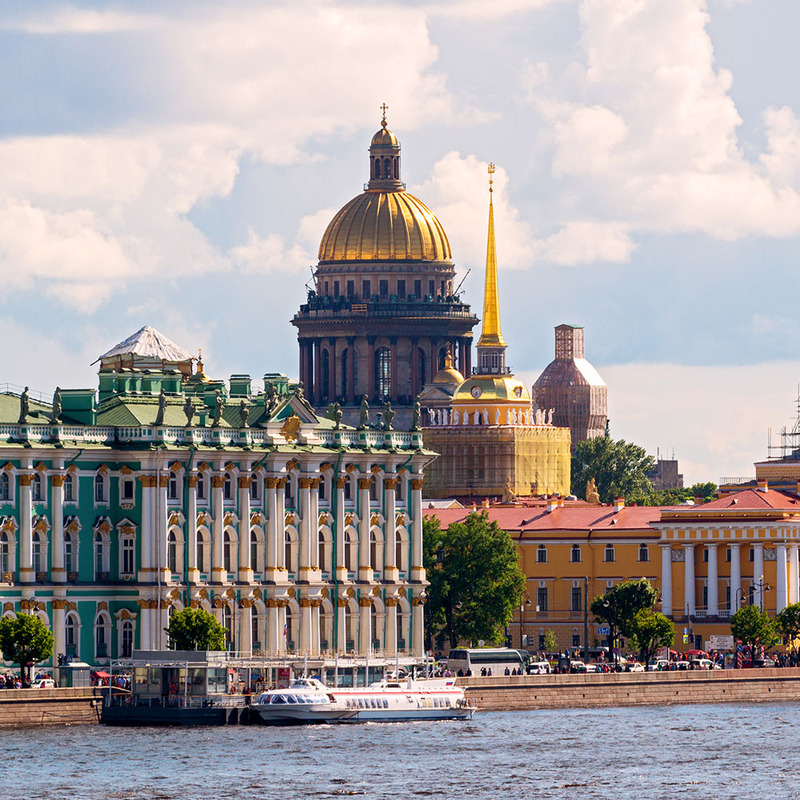 Our final port of call is often described as Europe's most beautiful city: St Petersburg, founded by Peter the Great in 1703, was designed to be a showpiece of the Empire, with majestic architecture and breathtaking vistas that have inspired artists and writers throughout the ages. 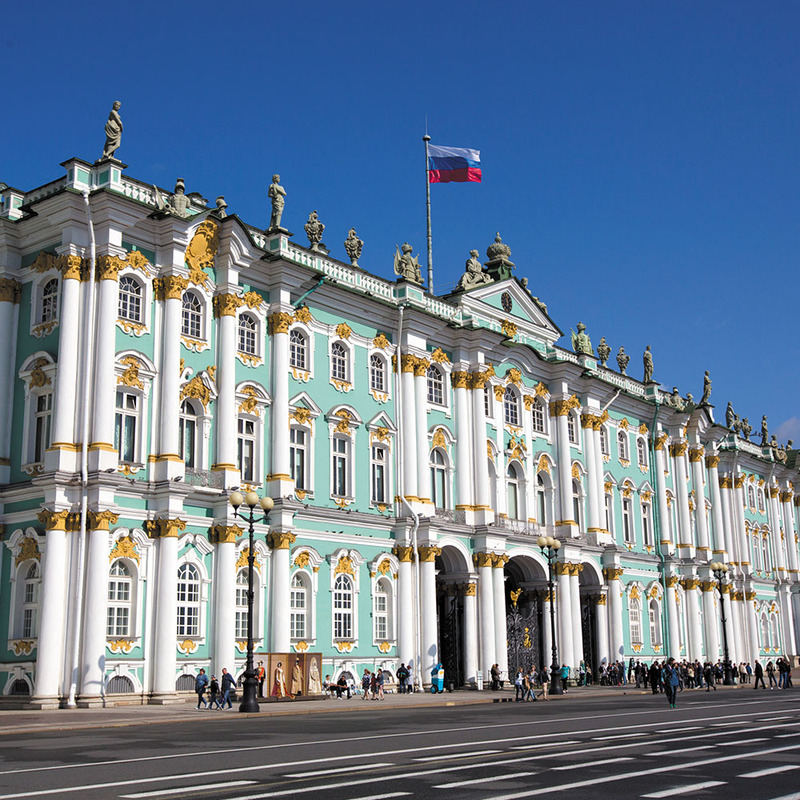 Our cruise includes a visit to the world-renowned Hermitage, which features an exceptional collection of priceless artworks housed in some of the city's finest buildings, including the Tsars' beautiful Baroque-style Winter Palace. You fly to Moscow, where a coach will transfer you to the ship, moored in this unique city. The professional crew welcomes you on board and there’s time to settle in and familiarise yourself with the layout of the ship before dinner is served. Our adventure has truly begun and there’s a real sense of excitement on board. Set yourself up for this morning’s tour with breakfast from the buffet, whilst chatting with your fellow passengers about what lies in store. Churchill famously described Russia as ‘a riddle wrapped in a mystery inside an enigma’ and this still seems apt. Formerly a powerful tsarist empire and a Communist superpower, yet today having a cosmopolitan feel very much, it holds a real fascination. European Russia, which stretches from the borders of Belarus and Ukraine to the Urals over 600 miles east of Moscow, even without the vast Russian Federation, is the largest country in Europe. From humble beginnings as a small wooden settlement in the 12th century, despite invasions from the Mongols and Crimean Tatars over the following centuries, the city continued to grow and, by the 17th century, had a population approaching a quarter of a million. In 1712, Tsar Peter the Great moved the capital to St Petersburg and Moscow entered a period of decline, but by the 19th century the city was flourishing again until Napoleon’s invasion. The Industrial Revolution in the late 19th century once more began to transform the city until the Communists imposed a totalitarian regime in 1917 and Lenin moved his government to Moscow. Then came Stalin’s regime of terror, which lasted for a quarter of a century; he oversaw the war machine that helped to defeat Nazism, but also caused the death of tens of millions and the destruction of many historic buildings. A failed coup against Gorbachev in 1991 marked the end of the USSR, and Moscow is now Russia’s richest city. On this morning’s tour you will learn more about its fascinating story. At the centre of it all lies the iconic Red Square with its wealth of instantly recognisable buildings: St Basil’s Cathedral, the glorious colours of its cluster of onion-shaped domes, topped with glinting golden crucifixes, and the turrets and spires of the vast Kremlin fortress soaring high above its huge ornate walls. See the austere granite slabs of Lenin’s mausoleum and the mighty State Historical Museum, housing vast, priceless collections. Visit the famous GUM State Department Store, with its immense glass roof reminiscent of London’s 19th-century railway stations, see the dazzling white façades and shining domes of the Cathedral of Christ the Saviour, and enjoy panoramic views of this intriguing city from Sparrow Hills overlooking the mighty Moskva River. We will enjoy lunch in a local restaurant, after which you’ll have free time to further explore. Share your stories with fellow passengers over dinner, before retiring to the bar for a nightcap. Rise refreshed and ready to discover more of this historic city. On our guided tour this morning we return to the Kremlin, which formerly housed the Russian government, with stunning palaces and cathedrals enclosed behind its vast walls. See the Tsar’s Bell and Cannon and the mighty Ivan the Great Bell Tower, once the tallest structure in the country, its gold, onion-shaped domes piercing the sky. You’ll learn more about the history of this immense complex and enjoy a stroll around its grounds, seeing the Cathedral Square lined by three magnificent, gold-topped cathedrals. After lunch back on board, the rest of the day is at leisure, so why not take a trip on the famous marble-clad metro with its spectacular stations, or see the impressive university and the stunning Bolshoi, home to one of the world’s finest ballet companies. Perhaps visit Stalin’s bunker or the thought-provoking Gulag Museum, dedicated to the history of the labour camps that once existed in the Soviet Union, or Tolstoy’s house and museum, which provides a fascinating insight into the writer’s life. Or simply wander the grand arcades of Tverskaya Street and soak up the atmosphere. As we set sail along the Moscow Canal, which connects the Moskva and Volga rivers, the Captain’s welcome cocktail reception is served before dinner, so relax in the lounge and take in the changing views through the ship’s panoramic windows. There’s something special about waking on board a river cruiser and finding yourself transported somewhere new. Draw back the curtains to reveal a hilly landscape with a scattering of wooden houses and quaint churches amidst the green slopes. Roughly three quarters of Russia’s population lives in its towns and cities, so much of the rural landscape seems deserted and almost unchanged since the days of the USSR. Head up on deck to watch some of this tranquil scenery slipping by as our ship glides through the calm waters of the Volga. Enjoy a leisurely lunch in the restaurant before we arrive in picturesque Uglich. Its name coming from the word for ‘corner’, this attractive city on a sharp bend of the Volga forms part of Russia’s Golden Ring, a group of ancient towns that played an important part in the formation of the Russian Orthodox Church and are now open-air museums, with a wealth of unique monuments and colourful architecture. We will enjoy a walking tour of the city’s Kremlin, once surrounded by water and now perched high on the river bank. It’s an impressive ensemble of seven buildings, including the renowned green-domed Cathedral of Transfiguration and the striking Church of St Dmitry on the Blood, a blaze of red-and-white façades and royal-blue domes. The latter marks the spot where the youngest son of Ivan the Terrible died in suspicious circumstances, an unsolved crime that changed the course of Russian history and precipitated the Time of Troubles, a dynastic and political crisis, which ended with the establishment of the Romanov dynasty in 1613. We return to the ship with time to relax before dinner. During this morning’s breakfast, our ship arrives in the ancient city of Yaroslavl, the largest and oldest city of the Golden Ring. Spectacularly sited at the confluence of the mighty Volga and Kotorosl Rivers, this UNESCO Heritage site developed into a major commercial centre from the 11th century. During the 18th century, Empress Catherine the Great ordered urban planning reforms for the whole of Russia, and the city was sympathetically renovated in the neoclassical style of the time, fortunately sparing some fine historic churches. We will wander the charming old town, admiring the elegant façades of merchants’ houses, each more impressive than the next. See the exquisite 17th-century church of Elijah the Prophet, known for its vibrant frescoes, and stroll the grounds of an ancient monastery with its medieval holy gate. The more energetic may fancy climbing the cathedral’s bell tower for wonderful views of the rivers and city below. The first woman to orbit Earth came from Yaroslavl – a result of Russia’s involvement in the ‘Space Race’, the Cold War rivalry between the US and the USSR for dominance in spaceflight capability – and a plaque commemorating her achievement can be seen in the old town. We return to the ship for lunch and enjoy a relaxed afternoon’s cruising through the Rybinsk Reservoir. Construction began in 1935 under Stalin, with historic towns and hundreds of villages submerged in the process, necessitating the resettlement of more than 150,000 people. At the time, it was the largest man-made body of water on earth and, on completion, it took three years to fill! As evening falls, enjoy another delicious dinner in the ship’s restaurant and live music in the bar afterwards. As the morning sun edges its way above the gentle slopes of this idyllic landscape, head to the ship’s restaurant for breakfast. Admire the Captain’s skilful handling of our vessel as we dock at the pretty medieval village of Goritsy, the centre of one of the largest accumulations of monasteries in Russia. From here a coach will take us to the magnificent Kirillo-Belozersky Monastery, which was founded in the 14th century by one of the most revered saints in the Russian Orthodox Church. Beautifully sited on the edge of a glistening lake, a cluster of soaring spires and onion-domed roofs nestle behind its austere, white walls. On our guided walk of its historic grounds, you will learn about its history and wealthy patrons, including Ivan the Terrible and the Romanovs. After lunch, relax on board as we cruise the Volga-Baltic Waterway, part of an impressive 229-mile network of rivers and a canal linking the Volga to the Baltic Sea. As we pass through the ever-fascinating locks, the rugged yet majestic landscape drifts seamlessly by: thickly forested riverbanks cling to the water’s edge, punctuated by picturesque villages of colourful wooden houses in a scene unchanged for centuries. Dinner is served by your crew, after which take a digestif in the bar with newly made friends, or head up on deck to enjoy the views as evening descends. Overnight the MS Rossia has made steady progress northwards and today you will enjoy another wonderful morning’s cruising as we enter the waters of Lake Onega, Europe’s second-largest lake. More than 50 rivers feed into it yet only one originates from it. Its waters appear murky due to its high mineral content but are, in fact, very clean, and home to more than 40 types of fish. The lake has more than 1,300 islands, some with fragrant pines clinging to the rocky shores, and others where sandy bays are fringed by lime and elm trees. Red squirrels, brown bears, elks and lynxes roam the forests – watch out for ducks, geese and swans amongst the marshlands. Later we moor on the tiny island of Kizhi, an enchanting green sliver at the northern end of the lake. Thought to be a pagan site for Ugric and Finnish tribes, its significance grew as a centre on the trading route to the White Sea during medieval times. In 1951, an open-air museum was founded here, comprising a fascinating collection of restored 18th-century wooden structures brought in from nearby villages, including chapels, belfries, log houses, mills, bathhouses and barns. Impressive as these are, the main attraction of this UNESCO-listed site is the extraordinary Church of the Transfiguration. Built in 1714 without using a single nail, this unique structure is sure to impress with its 22 onion-domed cupolas, some of which rise to a staggering 120 feet! We enjoy a walking tour to learn more about the history of this remarkable place. Reflect on all you have encountered today with your fellow travellers over tonight’s dinner as we slip our moorings once more. We experience another highlight this morning as we cruise the scenic River Svir. From its source at Lake Onega, it runs 139 miles to the largest lake in Europe, Lake Ladoga, which forms part of the extensive canal systems to the Baltic. Head up on deck and enjoy this diverse and atmospheric landscape: steeply sided riverbanks splice the depths beneath, emerald-green marshes alternate with red rock faces and isolated villages, with their scattering of timber houses seemingly frozen in time. Before long, we moor in picturesque Mandrogi. This quintessential Karelian village, reliant on its fishing and mills, was a place unchanged for decades until it was completely destroyed during the Second World War. After the fall of the Soviet Union, a group of Russian investors bought the land and employed the region’s most skilled craftsmen to restore the town to its former glory. By 1999 the transformation was complete, and today it is a joy to wander the cobbled streets, admiring the traditional woodwork of the colourful ‘izbas’, gingerbreadlike buildings with masterfully carved roofs and window frames. Stroll through the artisans’ quarter and browse the traditional handicraft: paintings, embroidery, pottery and, of course, the beautifully painted ‘matryoshka’ dolls – the famous wooden stacking dolls in colours of every hue. Enjoy time at leisure absorbing the ambience; why not take a ride in a horse-drawn carriage and stop for a ‘piroshka’, a delicious puff pastry, or perhaps a shot of vodka. The most popular museum here is dedicated to this quintessential Russian spirit, the classic recipe patented in the late 19th century by the inventor of the periodic table. After a barbecue lunch on shore (weather permitting), we’ll spend the afternoon relaxing on board. Tonight we’ll sample the gastronomic specialities of the region during the Captain’s Farewell Dinner. This morning as we reach our journey’s end, early risers will enjoy our stately arrival along the River Neva into spectacular St Petersburg. With a history dating back 300 years and today a UNESCO World Heritage site, this grand imperial city will enchant you with its gilded domes, glittering spires and magnificent architecture. Founded by Peter the Great, who moved the capital here from Moscow in 1712, Russia’s second city is his successful attempt to emulate the great Western European cities of the time. The most skilled architects were drafted from all over Europe, creating a diverse mix of architectural styles and stunning vistas that have inspired countless artists, such as Pushkin, Dostoyevsky, Rachmaninov, Tchaikovsky and Shostakovich. Following Lenin’s death and the Revolution, which changed the course of 20th-century world history, the city was renamed Leningrad. During the Second World War, Hitler besieged the city in an event that defined its history; one million people died from shelling, starvation and disease during the ‘900 days’ of the prolonged military blockade. The city survived and as the USSR crumbled during the 1990s, the city’s name was restored to St Petersburg. We enjoy a panoramic tour seeing the main sights, including bustling Nevsky Prospekt, the city’s most famous avenue, its largest department store, the National Library and the monument to Catherine the Great. 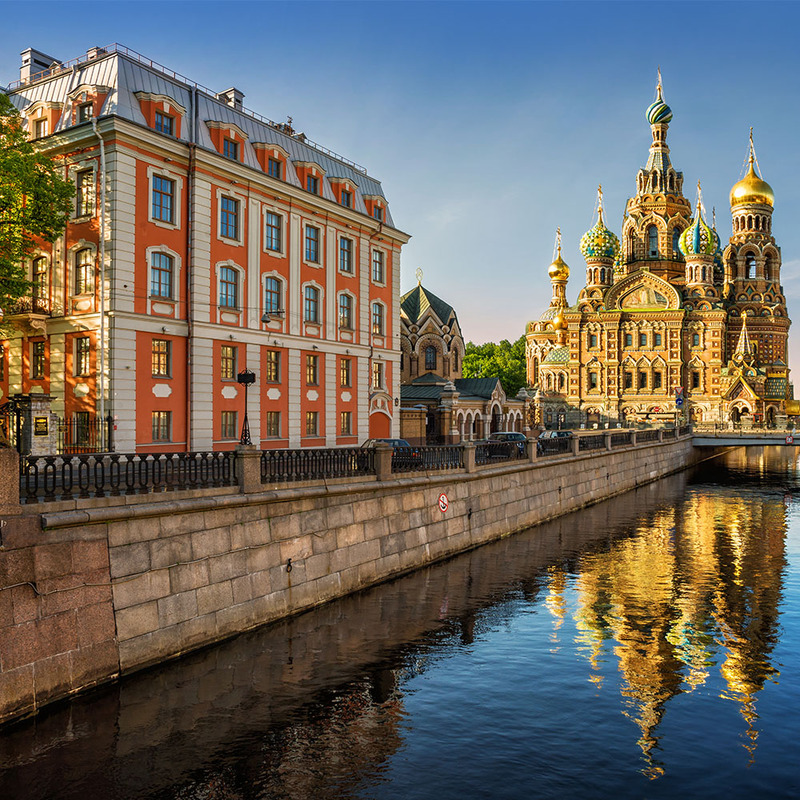 See the spectacular Church of the Saviour on the Spilled Blood with its exquisitely colourful domes and glorious frescoes, and the glistening golden domes of Saint Isaac’s Cathedral, the fourth largest in the world. We return to the ship for lunch with free time after to explore. Perhaps return to the historic heart of St Petersburg to see the Russian Museum’s extensive collection, shop at the historic Gostiny Dvor arcade, or stroll through one of the many lovely parks to absorb the cosmopolitan ambience. By evening you’ll have worked up an appetite, so why not relax in the ship’s lounge with your favourite aperitif before dinner is served. Today brings another highlight with our guided visit to the world-renowned Hermitage Museum. Open to the public since 1852, it was founded in 1764 by Catherine the Great and its vast collection of over three million items, including the world’s largest collection of paintings, occupies an impressive complex of six historic buildings along the river embankment, including the spectacular Winter Palace with it pastel colonnaded façade, the former residence of the Tsars. See the ornate Great Church, the Romanovs’ private place of worship, and the opulent Pavilion Hall with its exquisite mosaic tables and extraordinary golden Peacock Clock, created by an English clock maker. There’s the Gold Rooms of the Treasure Gallery, containing a dazzling array of ornaments and jewellery plus a whole host of further galleries with jaw-dropping collections of artworks by Rembrandt, Da Vinci and Caravaggio – you’ll be spoilt for choice. After lunch in a local restaurant, you may wish to return to the ship or remain in St Petersburg to further explore the historic centre. Perhaps stroll the fine boulevards admiring the city’s elegant architecture, or visit the Fabergé Museum, located in a superbly restored palace and home to the world’s largest collection of pieces by the famous jeweller, which includes nine imperial Easter eggs. When dinner is served, you’ll no doubt have stories to recount with newly made friends before returning to the bar to unwind and enjoy tonight’s live entertainment. The day is at leisure so you may wish to further explore or relax on board. So what is it to be? Perhaps visit the Peter and Paul Fortress, a former prison founded in 1703. Its ornate cathedral, with beautiful marble columns and chandeliers, is the final resting place of many of the country’s rulers, including Catherine the Great and the Romanovs. Art aficionados may wish to visit the Museum of Contemporary Art or return to the Hermitage to visit the General Staff Building, one of the most famous architectural monuments in St Petersburg, with its impressive collection of works by Monet and Renoir amongst others. For lovers of history there is a host of palaces, such as the Stroganov Palace with its salmon-pink façade or the superb Marble Palace, constructed from 36 different kinds of marble. Or simply wander the city’s parks and stroll along the network of canals, stopping to admire some of the city’s countless bridges. As evening falls, enjoy your final dinner on board and reflect on what has been a truly memorable cruise. Prices are per person, based on two people sharing a twin cabin. Single cabins are available at the relevant supplement. The price includes full board from dinner on your day of arrival until breakfast on your final day, two lunches in local restaurants; all visits and excursions as mentioned in the brochure, airport transfers, coach travel as mentioned, travel to and from port of embarkation and the services of a Riviera Travel Tour Manager. Please note that on-board Wi-Fi speeds may vary. On reverse-order itineraries, arrival and departure points are the other way around.